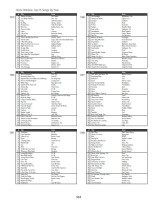 The original edition of Rock Omnibus was printed seven years ago was the most comprehensive listing of original music rankings from the last six decades (1950-2010) known anywhere in book form or on the web, with none of the extraneous filler seen elsewhere. The Rock Omnibus ranking system is not reliant on chart success, record sales or online/radio airplay, and includes many thousands of non-charting songs. View the Fact Sheet to see the details. Edition one contained 423 pages at 8½" x 11" full-page size, filled with 4,156 artist essential discographies of our top 17,800 songs (with the top 5000 ranked and annotated), artist and album rankings, and breakdowns by year/decade. The traditional artists are all there, from The Kinks, David Bowie, Fleetwood Mac, Otis Redding, U2, Miles Davis, and The Doors, to lesser-known artists like Carbon Leaf, Marillion, Prefab Sprout, Guadalcanal Diary, Big Star... onto the more obscure of Griffin House, Son Volt, Manassas, Local H, Jadis, Brian Protheroe, Screaming Trees, Brother Cane, Kashmir, Landberk, and the beat goes on... Rock Omnibus is the one definitive reference for the truly serious music fan. See our Complete Artist Listing to get a better idea of the wide range RO covers. All 4,156 artists listed on one page. The 2nd Edition of Rock Omnibus is planned for release in early 2020, expanded with 50% more material. Many gaps have been filled in from the first edition, and artist discographies are more complete. The new version will include a list of an artist's ranked and honorable mention albums in the main artist discography section. The top 2000 artists and top 2000 albums will now be ranked. In all, there will be over 28,000 tracks listed, with the top 8000 tracks ranked. Yearly top track and album lists will be greatly expanded. Beyond all the staples that we already delve into considerably, here are examples of extended discographies not found in the original 2011 Edition: Black Lab, Poets of the Fall, Shihad, Chevelle, Pineapple Thief, Dawes, Airbag, Big Wreck, Amplifier, Audrey Horne, Xavier Rudd, Killing Joke, Cynic, Harvey Danger, No-Man, Gazpacho, Edison's Children, Wilderness, Band of Skulls, David Crowder Band, Green Carnation, Buckcherry, The White Stripes, Dinosaur Jr., Arbouretum, Devin Townsend Project, Incubus, Goldsboro, The Wallflowers, Katatonia, Demians, Fireball Ministry, Manic Street Preachers, Lillian Axe, Sister Hazel, Ben Harper, Wire, Suede, Wishbone Ash, Gypsy, O.S.I., The Cult, Bob Mould, Jane's Addiction, Nick Cave & the Bad Seeds, Ocean Colour Scene, Nada Surf, Pallas, Neal Morse, The Exies, Sonic Youth, New Order, Lee Ritenour, Rival Schools, Young the Giant, Hell or Highwater, Mat Kearney, Faith No More, Ian Brown, Torche, Public Image Ltd., Shearwater, Ryan Adams, New Model Army, Diana Krall, Michael Been, Saigon Kick, Fountains of Wayne, Evanescence, Fugazi, Echolyn, and the list goes on and on... (and on). All of these are worthy additions to the already extensive listing in the original Rock Omnibus, which has all the classics, a healthy dose of the non-classics, and a little of everything else sprinkled in. Watch here for more information as time for publication of the 2020 edition nears. Songs are first grouped by artist discography for easy cross-referencing, with another section displaying #1 through #5000. 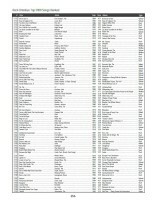 The top 5000 RO tracks are ranked in order, showing year, album and track time, in addition to another 12,800 honorable mentions. The top 1000 artists are also ranked, showing the artist's starting and ending years, the artist's country of origin and key band members. The top 1000 albums are also ranked. Other listings in the book show the top 25 songs by year, top 50 songs by decade, top 10 albums by year, top 25 albums by decade, top 50 artists by decade, and more. All in one expansive yet concise volume that leaves out the fluff. While other music listings tend to parade an excess of charting songs and fail to mention very many of the non-charting tracks, Rock Omnibus has the pertinent information on a wide array of songs you'll want to add to your playlists. Whatever your music taste, we've got a wealth of recommendations for you — organized in an easy-to-navigate format. "If you had a 100 GB iPod to fit it all on, Rock Omnibus would be the playlist that would win World War mp3"
You've seen books with a third this much information selling for $40. But Rock Omnibus has been priced at $28.95 (Note: 2011 Edition currently out of print), to get the entire world of music at your fingertips. Spiral bound for easy navigation. The online PDF version was prevoiusly sold for $15.95 — fully searchable and indexed with bookmarks. 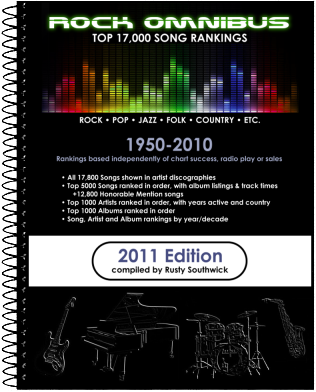 The criteria for ranking the songs is strictly from author Rusty Southwick's assessment, with no direct influence coming from chart history, sales, radio play or other critical review. The entire list was compiled exclusively by Southwick, who personally listened to and critiqued all 5000 of the ranked songs and over 12,000 of the honorable mentions (with some other content being included primarily for its historical value). Various components of song quality are taken into account through systematic analysis, including melody, songwriting, vocals, lyrics, virtuosity, originality, guitar presence, keyboard interplay, drum backup, other instrumental contributions, and more. A graded point system per song is used as a guide for ranking the albums, along with general album cohesiveness, and the combined song and album ranking is used as a guide to formulate the artist rankings. There are no shortcuts to compiling a list such as this. The only way it was possible was to individually sample these and many thousands of other songs, make cross-comparisons using a consistent set of criteria, and then meticulously pare them down to a select group. What a lot of music fans don't realize is that the pop charts are merely the beginning of the discussion, and there's a lot more music out there than the charts can adequately promote. Rock Omnibus helps you find what you've missed if you've relied on the purveyors of the almighty smash hit single to educate you. Culturally speaking, they bend with the trends in order to reap short-term benefits, but it doesn't necessarily reflect the best material available. This is where Rock Omnibus comes in — an indispensible resource for filling in the gaps in your playlist, whether it be from current tracks or earlier eras. Even online radio stations are not going to be this thorough and this deep. 423 pages packed full of artist anthologies, the perfect gift for any music fan. The premiere 2011 edition of Rock Omnibus was published in January 2011. To get all the information about Rock Omnibus, go here to the Fact Sheet. Our extensive, no-nonsense list was culled from listening to songs based on recommendations from hundreds of websites, bringing it all together and placing Rock Omnibus at the center of significant rock n' roll listings from the 1950s to now. The Rock Omnibus Project begins here with our first edition, encompassing music from 1950 to 2010. Readers will be able to submit listing recommendations online, in preparation for future editions. Rock Omnibus will continue to evolve into an even greater resource as time goes on. To learn about popular and rock music from 1950-2010, this is the reference that gives you access to the most important listings, without having to wade through entire catalogs one artist at a time. This will be the resource used by serious music buffs to get their collections up to date in their chosen area, be it classic rock, pop, folk, progressive, R&B, jazz, hard rock, metal, easy listening, country or others. See our Complete Artist Listing. In the book's first section, the 17,800 songs are grouped in artist anthologies for easy referencing. Album and track time are included for each of the top 5000 ranked songs. There are also rankings of the top 1000 artists and the top 1000 albums. 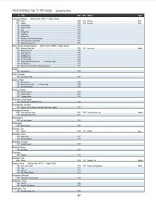 Breakdowns of top songs and albums by year/decade, as well as top artists by decade. Also charts showing trends through the years. Click here if you'd like to refer any of your friends to Rock Omnibus. 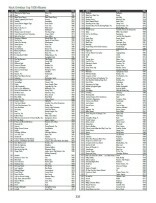 The above graph gives a representation of the number of songs by year in the Rock Omnibus Top 17,800 Rankings. The hot spots shown also take into consideration how high the rankings of the songs are for each period, with the highest being between 1967-1979 and 1983-1987. Find out in the book how this curiously mirrors the pattern of the quantity of #1 songs on the charts within a given year. For example, a year where songs commonly go a couple months at #1 and there are only about 10-15 #1's that year may have a correlation to the lack of high level material out there at the time, with the premise being that there is lower competition to challenge the #1 songs. Conversely, in fertile times, #1 songs change over on a regular basis because there's much to supplant the current #1 with. Incorporating rock, pop, jazz, folk, country, and related genres, with the main focus being on rock and then pop, Rock Omnibus spans the full gamut of rock and related styles, also sampling genres and subgenres such as progressive, metal, blues, reggae, R&B, easy listening, soundtracks, new age, electronica, and others. Note: Due to considerable sentiment by rock aficionados to maintain a distinction between rock styles and the rap genre, as well as to provide a counterbalance to the more recent chart trends highlighting a sizable percentage of rap styles, our listings do not include strictly rap/hip-hop artists or songs. This is also to further establish Rock Omnibus as a purely rock-based listing. Click on page samples below to view pdf files (Adobe Acrobat required). Click on any of the playlists below to listen a sampling of the highest-ranked songs in Rock Omnibus. What you'll find here is an eclectic mixture, combining the classics with the hidden gems, spanning well-known artists as well as the lesser knowns. Does Rock Omnibus have them? See our Complete Artist Listing page to find out. 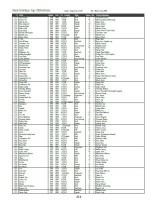 Also get the list as a free download (see below). See why Rock Omnibus is the ultimate reference for music lovers everywhere. There's something for every listener, whether they be a dedicated aficionado, a nostalgia buff, music historian, or simply someone who likes to find out more about what songs are out there. It's all here in one place, ready to be explored. 423 pages packed with relevant discographies from over 4000 artists, listing their significant tracks. Rock Omnibus will eventually be known as the truly distinctive reference music fans will use over and over again. While various music ranking systems have a few of the key attributes, Rock Omnibus brings together the most practical aspects of a song listing to give you the greatest access to the pertinent information. We've filtered out the unessential songs and brought in the ones that the others were missing. That's because we don't rely on chart success — or any other popularized factor — to measure the quality of the songs. Instead, author Rusty Southwick listened to each individually and judged them on their own merits, irrespective of cultural trends that bring so many ancillary factors into the equation not having to do with the actual music itself. This is music analysis pure and simple. Refer any of your friends to Rock Omnibus, and we'll e-mail them, telling them all about the book. The premiere 2011 Edition of Rock Omnibus (Vol. 1) was published January 2011. It was made available in book form and as a pdf download. © 2011 Vintage Songworks. All rights reserved.